Hotel Slip and Fall Causes and Injuries | Hupy and Abraham, S.C.
A hotel’s management team has the responsibility to care for guests and to keep guests free from foreseeable injuries. When a hotel fails to act in a responsible way and instead acts in a negligent way, the victim may hold the hotel legally responsible for any damages that may have occurred. Inspections. Those who work at the hotel should be taking the time to properly inspect the hotel grounds to insure that all walkways, stairways, and lighting are adequate for a guest to safely navigate the hotel grounds. Cleaning. A hotel can quickly become littered with luggage, trash, food, and other objects that can create a dangerous environment to walk through. The hotel has a duty to clean areas as needed in order to keep its patrons safe. Repair. There are a number of dangers that can develop as a hotel begins to deteriorate over time from the heavy use of those who stay and work there. Leaks, torn carpet, loose handrails, and burned-out lights should be fixed quickly in order to prevent a slip and fall accident. When a hotel fails to conduct inspections, clean, or make repairs, then significant injuries can result. Fractures. 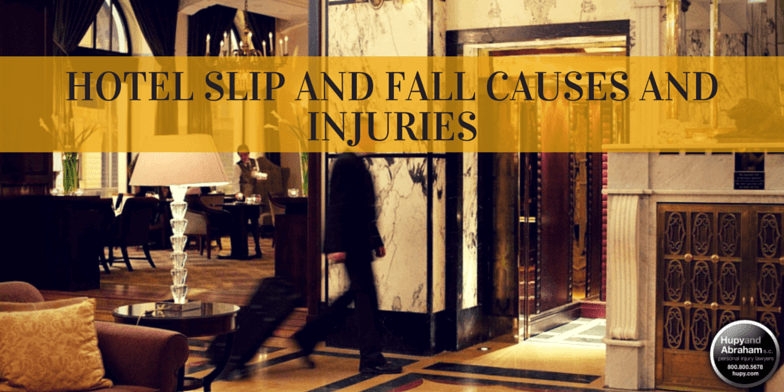 Fractures associated with hotel slip and fall incidents occur when the body falls and lands on hard surfaces. Although fractures can happen to anyone, they are most common in elderly victims. Traumatic brain injury. During a fall the head will often collide with a hard object. This can cause a traumatic brain injury (TBI). A TBI can cause the victim to suffer from cognitive impairment, mood changes, or seizures. Back, neck, and shoulder injuries. A fall or trip can result in injuries to the back, neck, or shoulder areas by damaging the muscles, joints, and ligaments. It can also cause strains, sprains, and herniated discs. Knee injuries. The twisting and turning caused during a slip and fall can lead to damage in the knee. This may include a sprain, strain, or tear in the soft tissue. If you have suffered these or any other injury from a slip or fall caused by the negligence of a hotel, then you may be entitled to compensation. Discover how we can help you make a fair recovery by calling 800-800-5678 today. There is no charge for your first consultation with a premises liability lawyer and we only get paid if we can win a recovery for you.